Incorrect Short Sale Myths: Don’t Believe The Hype! A short sale can often be an excellent solution for homeowners who must sell and owe more on their homes than they are worth. Unfortunately, a number of myths about short sales have developed, and it is important to understand the reality of this process should you find it meets your current needs. It is also immensely important to understand the crucial role that a qualified short sale agent plays in dispelling incorrect myths and successfully navigating through the arduous short sale process. Short sale transactions can be complex and ensuring the transaction is structured properly and the timeliness of process execution are of the highest importance. 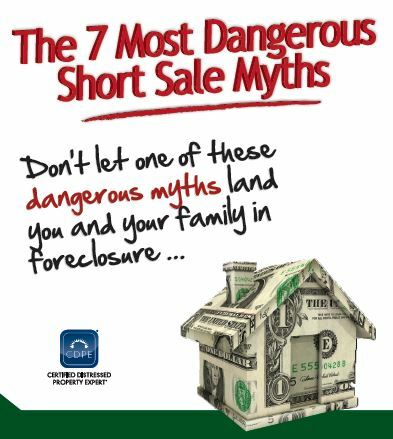 Short Sale Experts, Inc is offering you a FREE Special Report entitled “The 7 Most Dangerous Short Sale Myths” which dispels the most prominent incorrect myths of short sale process execution. Download the report, read the stories, and then contact me for a free, confidential consultation. Simply fill out the form below and tell us where to email the E book.